into priceless jewels and shining sculptures. The “Earth Mother” goddess who created humanity, full of harmony and equilibrium, Delance “Cybele” watch is a muse in her dual form of woman in love and mother. 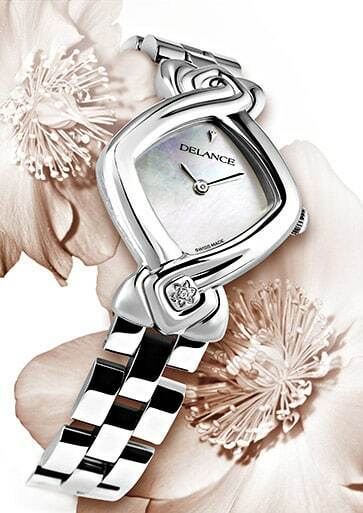 A daring, yet surprisingly gentle sculpture, the DELANCE “Eclat de rire” watch was created for a stunning, joyful woman. Studded with 242 diamonds of different sizes, the watch sparkles with thousands of little lights. Life is a dream, and if we are artists, we can create our lives with love. Each leaf of the DELANCE “Four-leaf clover” watch brings hope, faithfulness, love and luck. It is a statement of love, love for self and others. This amazing Delance “Esperanza” watch is set with a veritable flurry of 130 diamonds of different sizes, a sparkling blizzard that moves from east to west, showing the way to the royal path that leads to serenity. Its artistic gem setting symbolizes the talent of a woman who intuitively knows how to convert the legacy of her ancestors into a personal creation. Thanks to her choices, the DELANCE “Heritage” watch is ready to be transformed into a true treasure, a family jewel to be handed down through the generations. She is fragile, spiritual, creative but each day she is reborn stronger, more beautiful and marvelous. Her enchantment, when she wears this watch, is much like that of the butterfly effect: a single wing beat can set off a tornado on the other side of the world.